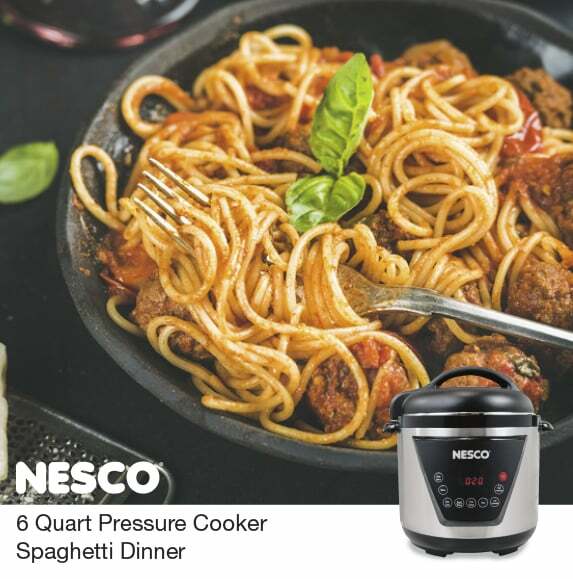 This recipe for a wholesome spaghetti and meatball dinner is extremely easy in your NESCO® 6 Quart Pressure Cooker. Simply add all the ingredients in the order of the recipe, lock the lid and set. In only 10 minutes you have a wonderful meal. Let us know what you think. What are some of your favorite meals you like to make in your NESCO Pressure Cooker? Pour all ingredients in the order listed into the cooking pot of your Nesco® Pressure Cooker. Lock lid into place and set the pressure regulator knob to SEAL. Cook on High for 10 minutes.